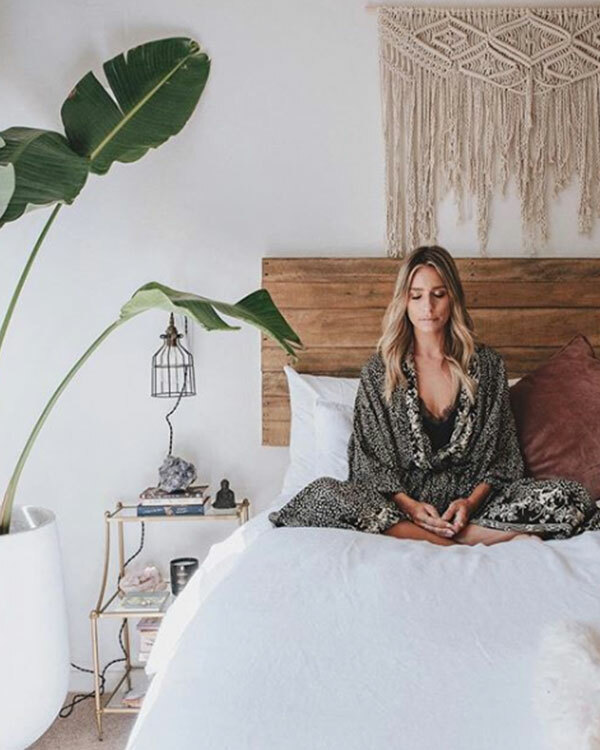 Growing up on the sunny shores of Byron Bay, Renee Bargh is no stranger to an active life. Now residing in Los Angeles where she is killing it in her career as a co-host on US entertainment program, Extra, the Aussie-born also side hustles as a certified health coach and is obsessed with all things wellness. When she’s not on the red carpet or interviewing the likes of Oprah and Tom Cruise, you’ll find her working on that figure, enjoying a homemade smoothie (or cheese platter, depending on her mood!) and practising self-care through daily meditation. Basically, we wanted to know everything Renee does in the name of health so we quizzed her on it all (and more) below. Have you always had a passion for wellness? What inspired you to pursue this further as a health coach? I definitely always leaned towards a healthier lifestyle and my mother was an incredible cook who ensured we were really healthy kids. A few years ago however I started to struggle with some stomach issues and realized I wasn’t feeding myself the right things so to get a better education on the matter I studied integrative nutrition and I was able to get a better understanding of most of the issues I was dealing with and learn how to properly take care of myself. What are some of the most important health and wellness lessons this has taught you? Bio-individuality is key—what works for me won’t necessarily work for you. Listening to your body is super important and the fresher and cleaner the meal/ingredients the better. What does your typical day on a plate look like? Breakfast is usually a smoothie with banana, almond butter, almond milk, spinach, and vital proteins collagen powder, sometimes I make a tonic with coffee almond milk, ashwaganda, reishi and cordyceps. I alternate between smoothies and eggs. On the weekend I like to make a big breakfast with sautéed kale, poached eggs, spinach, avocado and micro greens. Lunch is usually a piece of grilled salmon and a salad and dinner is normally a roast vegetable bowl or fish and vegetables. What does your fitness routine currently look like? I just finished a 12-week transformation program at UP fitness and that consisted of 3-4 one on one training sessions a week. Since finishing that I’ve been taking it a little bit easier but am still going to F45 two times a week and hot yoga two times a week. What other workouts do you enjoy or would like to do more of? I love dancing—it’s my favorite way to work out. I also like pushing myself and doing classes like Barry’s Bootcamp or F45. Is there a particular workout you’ve tried and knew straight away it wasn’t for you? Yes CrossFit. I tried it once and it hurt my body in ways that I knew it shouldn’t—it just wasn’t right for me. I think you have to make sure your form and technique is perfect when doing certain workouts. What are three things you couldn’t go a day without? Dark chocolate, Lucas Papaw Ointment (it’s very dry in LA) and celery juice. In your opinion, how does the wellness scene in LA differ to that of Australia? A few years ago I definitely felt a difference but now I think they really are on par with each other. I think there may be more fads in LA and everything may be a little more extreme whereas in Aus it all feels a little more organic and part of the lifestyle there. But given the population and accessibility, there’s definitely a lot more options in terms of markets, health stores and workout classes etc. What are some of your favourite healthy hotspots in LA? Gratitude cafe, Bluestone Lane, Croft Alley, Tocaya, Erewhon, M Cafe. What’s one thing you miss most about Australia? Well aside from my family, the beaches, that beautiful clean and warm water always lures me back. In what ways do you practice self-care and how do you find you benefit from it? I practice TM meditation twice a day for twenty minutes and the benefits are endless. I’ve found that it makes me less reactive, more present and definitely calmer. What is your favourite holiday destination and what’s next on your bucket list? I’m a travel junkie so my list is very long and I love many different places for different reasons… Positano and Tulum have to be up there as my favorites so far… I haven’t yet been to the Greek Islands or Croatia so that’s top of my list. What is your approach to new year’s resolutions? Did you set one for 2019? I stopped making them because like everyone they would be ditched early on and I’d be left feeling guilty about it. For 2019 I just want to do more of what makes me happy. Apart from eating well and exercising, what else do you do to maintain your figure? I think just having an active lifestyle is key but also a happy and healthy state of mind. Meditation and getting plenty of rest is just as important. Are there any specific foods you don’t eat in the name of health? I TRY to stay away from fried foods and I don’t eat a lot of meat, only on rare occasions. I also stay away from anything processed or packaged really. The fresher the better. When it comes to diet, do you follow any particular style of eating? No I just listen to my body and I am a bit of a grazer—I eat when I’m hungry but don’t overeat. Cheese! I love it so much a cheese board is my dream! You meet so many celebs! Can you recall your biggest starstruck moment? Definitely, the first time I interviewed Oprah. She held my hand and looked into my soul and I completely lost track of where I was. She’s so present and stoic. I have had so many highlights as a co-host of Extra but most recently I would say being flown to Paris to interview Tom Cruise. I’d heard the most incredible things about him and he did not disappoint. He’s very giving and warm and engaging and treats everyone with respect. He has so much time for people and that’s rare to see in this business.